Building your dream home? If you fear that your master bedroom could end up looking a little too cookie cutter and would like your space to feel more personalized, implementing even one or two of these upgrades might be worth the splurge. 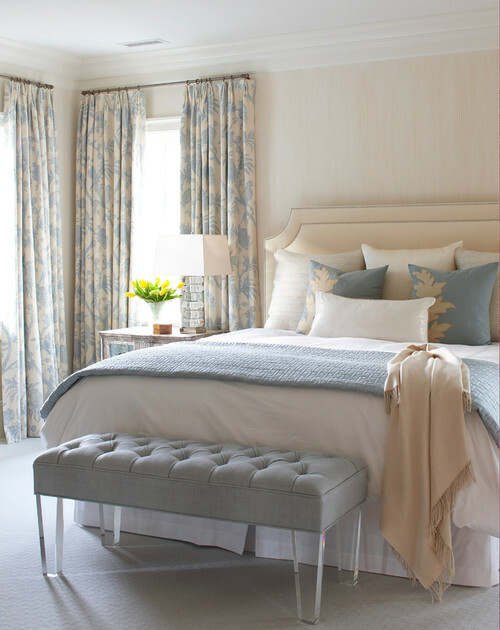 A simple carpet upgrade can make a bedroom look luxurious and feel much comfier underfoot. Speaking of comfy, a high-quality carpet pad can make all the difference in the look and feel of your wall to wall carpeting. Sure, ceilings that measure at 8’-0” might be standard, but a 9’-0” ceiling height (or higher) will instantly add character to a vanilla bedroom. Select a fun paint color. Rather than going with the standard ivory or beige on the walls, choose a tranquil blue, soft yellow, or even a bold color if you’re feeling adventurous. Crown molding or wainscoting will add an architectural element to even the dullest space. Talk with your builder about options that are within your budget. Dress up your bedroom with a chandelier. Let there be light! Yes, a chandelier (rather than a ceiling mount) will undoubtedly dress up your space. Straightforward and inexpensive, dimmers give you the ability to control the amount of light in any room. They’re a luxury worth every penny. Storage makes all the difference, and a customized closet will reap the rewards when you go to sell.